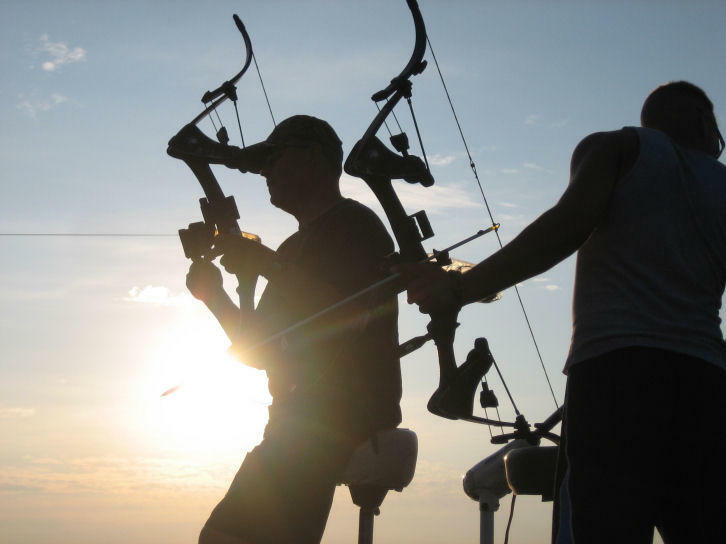 Texas archers can legally shoot any “rough fish” with a bow and arrow. Rough fish include gar (only one alligator garfish per day can be taken), carp, buffalo, grinnel (bowfin), mullet, and stingrays. During spring and early summer, gar spawn in very shallow water and offer some tremendous shooting opportunities. Drainage canals are great places to find spawning gar, as are flats in the backwaters of reservoirs. Some archers prefer to pursue the fish at night with spotlights, but I prefer bowfishing during the day. Small gar are plentiful at night, but I see far more during daylight hours and personally only shoot 3-5 foot gar for food. These days I pass on the super-sized specimens for conservation reasons. Let’s take a minute to talk about those big alligator garfish. According to the Texas Parks & Wildlife Department, the Texas state record is 302 pounds, caught on a trotline in 1953. TPWD notes that alligator gar can live for many decades. Gar are an extremely “smart” fish with true challenges to bowfishing and the oldest specimens have certainly evaded many hooks and arrows over the years. This is why few true giants are killed other than during spawning periods in shallow water. True bowfishermen respect their quarry and gar are highly respected by those who understand their unique attributes and the challenge of shooting one. They are quite tasty by the way. Never let a gar’s meat go to waste. They produce huge amounts of meat for their size and it is good friend, grilled or made into fish patties. Carp are also super fun to hunt. I’ll never forget watching my cousin Frank Moore prowl like a cat through the waters of a large canal north of Deweyville. With surprising grace for someone wearing neoprene waders in ankle-deep mud, he scanned the murky waters for potential prey. While scanning the shoreline behind me, I noticed him drawing his bow as a huge, yellow tail surfaced in a shallow grass flat, swinging lowly to the side like a ponderous oar. Before I could make out exactly what he was shooting at, a large carp shot out of the water with an arrow in its side, then rocketed away stripping all the line from his rig. The arrowed carp put up a strong fight, cutting a roostertail wake in the shallows despite the arrow through its body. After a considerable struggle, the fish had enough and Frank retrieved it. Moore and I had been bowfishing in this canal for the several years and always did well on carp. The one he shot that day probably weighed 20 pounds, but we have shot bigger ones there. Some mistakenly look at bowfishing as a sport mainly for the marshy, coastal areas but it thrives throughout the state and according to bowfishing expert Jeff Stewart the dense creek and river bottoms of East Texas are a prime place to shoot a variety of fish. “I’m all about hunting the gar in the Sabine River drainage and there are plenty of carp, buffalo and other species throughout East Texas to hunt as well,” Stewart said.